One Thanksgiving when I was in college in Minnesota, I went home with one of my friends who lived in South Dakota. After the festive dinner, when the dishes were done, the women sat down in the kitchen to work on crafts--making staw star ornaments, quilting and other handwork. That is a Thanksgiving tradition that I love, and try to carry on. I had a quiet Thanksgiving this year. I had pre-cut out some panels from donated fabric to make a charity toddler quilt. I was able to spend a couple hours Thanksgiving afternoon sewing the top of the quilt together. I sandwiched it last week and finished it this past weekend. This quilt is a collection of components. In addition to the donated animal fabric, the 2 checkerboard borders where a stack of 6 patch blocks I picked up at a guild yard sale swap. 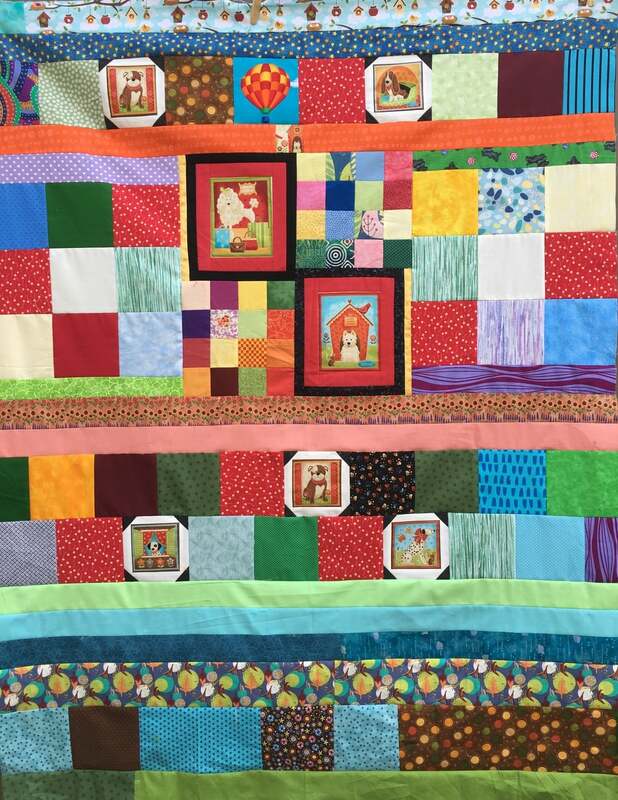 The binding was made from left-over sections of binding from other quilts. 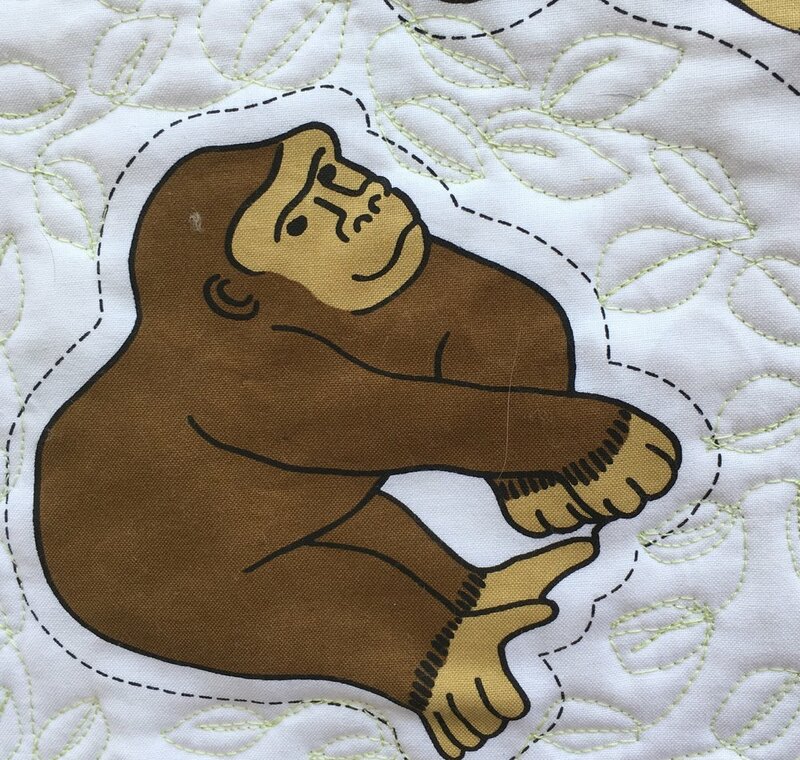 There is a variety of quilting in the quilt. The vertical bars have straight stitching 1/2 inch apart done with a walking foot. Running down the center of the top and bottom checkerboard border there is a machine embroidery stitch. There 3 free motion quilting fill patterns inside the blocks. I thought about what might be seen in the African bush. 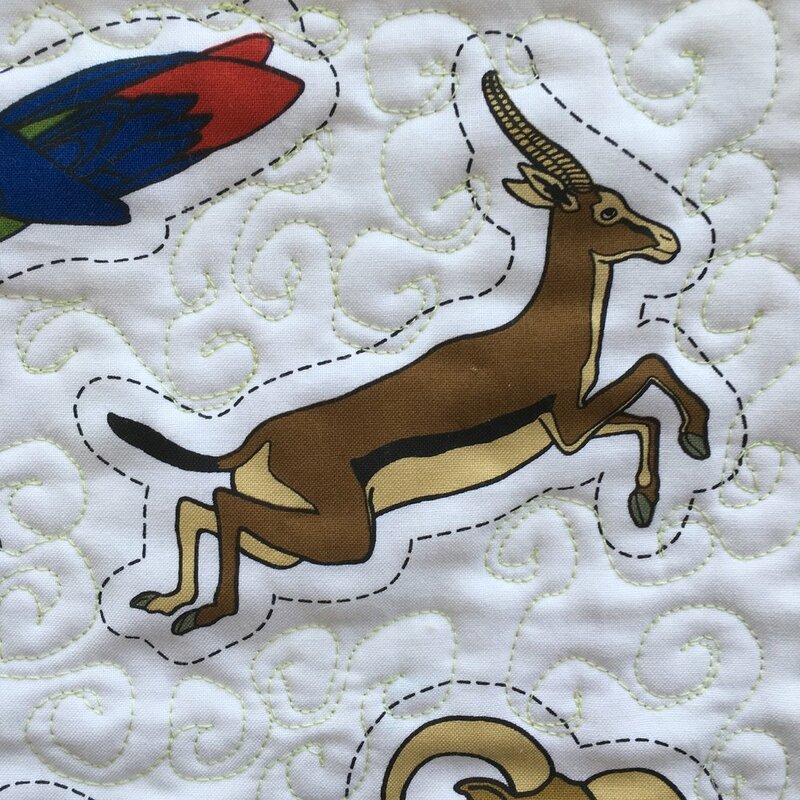 I started quilting near one of the springboks. Swirls of dust came to mind! So several of the blocks have swirls. In another blocks with a gorilla. I thought he would love having leaves, as would the parrots, and zebras. I also thought about the African night sky, far from city lights, filled with stars. So a single block is filled with stars! This was a happy project! It was so much fun to make and quilt!